Note: This is an ongoing post with updates. Scroll down for updates. I've been enamored by bread volume for a long time. I like my breads, but, I've always yearned to make the super volume, airy, razor-crusted loaves that characterize the baguettes used in Parisian street food. About a decade ago, potassium bromate was removed from most flour formulations. It was an agent used to strengthen dough, speed up aging and whitening of flour and contribute to huge volume. I'm not sure what combination of conditioners or additives replaced bromate, but one suspect is ascorbic acid. General Mills Pro formulations (Superlative, etc.) are spec'd at about 30-50 ppm ascorbic acid. Otherwise, the label ingredients look identical to the flour in the store. In order to determine the effect of ascorbic acid on bread volume, I designed this little flour formulation experiment. * I'm not baking a loaf, but checking the volume of the first rise as a surrogate endpoint for the final loaf volume (big assumption). I bought some vitamin C tablets, (ascorbic acid, 500 mg) and diluted it in Gold Medal Bread Flour to 50 and 500 ppm by successive solid dilutions. 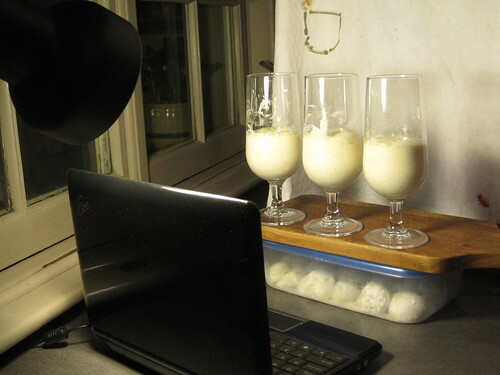 The 3 glasses contain flour (50 g), water (50 g), yeast (1 t). The glass on the left is straight unmodified flour, the middle is 50 ppm ascorbic acid and the right 500 ppm. I want to see which glass "test tube" contents give the highest rise before collapsing. It's getting late, it's a school night and I can't watch the results unfold. I set up the 3 tests and perched them in front of my netbook's webcam with a little piece of software to snap a pic every minute. I'll see what I see in the morning. *I realize I could buy a bag of flour with the ascorbic acid in it, but I'd have to commit to 50 lbs without a test. This way I can have a bit more flexibility. I can determine if the ascorbic acid does anything and I can alter its concentration to see what's best. Kind of fun to watch. This may be a very long post but I want to keep it all in one entry. I'm currently retesting this using an alternate and more accurate dilution of ascorbic acid. My test samples contain 0, 40, 80 and 200 ppm ascorbic acid in a slack dough of 25 g flour, 25 g water, 1 t yeast. I added the ascorbic acid as a 2 mg/ml solution to these to achieve those concentrations. Using the successive solid dilutions in flour, I feared, may have been inaccurate. We'll see. Exciting isn't it? In this case there is an effect on volume of fermentation even at the 40 ppm level, but the higher concentration is almost double. I'm having trouble reproducing these results. 1. Is the small-scale (25 g flour, 25 g water, 1/4 t yeast), fermentation volume evaluation a valid flour assay and does it relate to final loaf volume? 2. I'll be trying gluten addition also. 3. Comparisons not only with ascorbic acid and gluten additions, but General Mills vs. Montana Sapphire flour need to be done. 4. Final baked loaf volume needs to be added to the small scale fermentation volume to see if they are correlated. If they are, the small scale fermentation would be a nice flour assay for high volume crusty bread applications. Last night I just tried a loaf with Gold Medal (General Mills) flour and 50 ppm ascorbic acid and the loaf volume wasn't as good as my typical Montana Sapphire loaf. I need to try the Gold Medal without ascorbic acid and then try some gluten runs. Seriously cool, Dave! I can't wait to see how your experiment turns out. Awesome. How long did each experiment run for? Each ran a total of about 8 hours. The second one posted is the culmination of about 5 runs. Thee actual fermentation was finished in about 2 hours and the remainder was cut off and some "tape" left on to show the gurgling activity. Now the tricky part. Implementation to see if I get the wispy baguette I set out to make. On your second experiment, I think I saw a werewolf run by the window. He looked hungry! Cool. As I understand it, ascorbic acid does it's main work in the mixing phase, and that its most important effect is to strengthen gluten bonds. It might be that you would have different and perhaps more telling results if you were to knead the dough before assessing the effect. You can add 60ppm SSL (sodium steoryl lactylate) along with 80 ppm Ascorbic acid.You will certainly get the desired results.